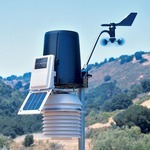 A wireless weather station with a versatile sensor suite that combines our rain collector, temperature and humidity sensors and anemometer into one package. You can customize your Vantage Pro2 by adding consoles or the special-purpose options. First and only weather station in its class to use frequency hopping spread spectrum radio technology to transmit weather data wirelessly up to 300m. •Electronic components are housed in a weather-resistant shelter. •Console may be powered using the included power adapter or with three C batteries (not included). •Wireless range is up to 300m outdoors, line of sight. Typical range through walls under most conditions is 60 to 120 m.
•Add wireless repeaters for distances up to 3km.